Successfully Added Balance - Mini Slider Cellphone (QWERTY, Dual SIM, Touchscreen) to your Shopping Cart. Our most convenient mini cellphone to date. The problem with most mini cellphones is that while extremely convenient to carry, they are often difficult and cumbersome to use. That’s why we’re excited to introduce the Balance- a powerful and easy to use mini slider cellphone with full QWERTY keyboard, dual SIM card slots, Micro SD slot, quadband GSM connectivity and more. The full QWERTY keyboard with raised backlit buttons makes typing long emails or text messaging much faster than with a normal keypad. And since all of the buttons are evenly spaced even people with larger fingers will have no problem selecting the correct button. The Balance features a 2.4 inch touchscreen that is both colorful and responsive. This makes it easy to navigate the entire menu system with the simple tap or swipe of your finger. There is also 3 hard buttons under the touchscreen for quickly confirming or rejecting your selection. Listen to MP3s, play your favorite video files or take 640x480 photos on a moment’s notice with the Balance cellphone. In addition there’s even a FM radio, GPRS internet, sound recorder, video camera, Java, analog TV tuner and Bluetooth support for hands free calling and file sharing. 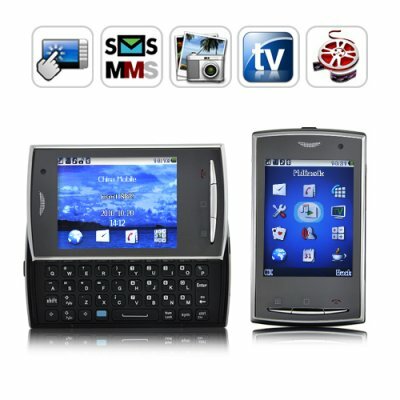 If you are looking for a powerful mini cellphone that works like a full-size cellphone then your search ends here. The best part is that you can own the Balance at a direct from the factory wholesale price that cannot be beat. Take this opportunity to order the Balance now while supplies last and we’ll ship your order out within 24 hours and even include our full 12 months warranty. NOTE: This product is compatible with all GSM networks at the four frequencies of 850MHz, 900MHz, 1800MHz, 1900MHz. This phone can be used throughout the world. Can I get my company name and logo printed on this phone then resell it? Sure. The minimum order is 1500 if you would like custom printing on this phone. If you are interested just send our customer service department an email. This phone is contract-free and fully unlocked so it can work with any GSM service provider you choose. Actually the word "unlocked" is a bit of a misnomer as this phone was never locked in the first place. Great to hear that the phone comes with a 1200 mAh battery, what if I want to order more? Where can I download some great free music for this phone? We love magnatune.com, great music from all genres. Check out Lara St John's amazing version of Vivaldi's Four Seasons or DJ Cary's Eastern Grooves. Aurgasm.us also has some very delicious tunes.